There are few places warmer than Montreal at Christmas! Fireplaces in nearly every restaurant and fire pits all around Montreal Vieux (Old Montreal) blaze, inviting guests to warm their hands. The stores are decorated with colorful displays for the holidays and the local chamber of commerce map even includes a "Light Tour" you can walk during the evening and see the city's historical buildings lit all year long. During the Advent and Christmas season, expect even more lights! Montreal put on a warm welcome for our recent visit! Rue St Paul decorated for the Christmas holiday! We checked into our Montreal Old Town hotel, the Marriott Springhill Suites on a Friday night. It was ideally located on Rue Jean-Baptiste, almost dead center of the historic Old City. The rooms were comfortable and clean and an expansive breakfast buffet was included. I was waiting for Jeff to fly into town and it was my job to find a restaurant for dinner. I selected a restaurant using the "walk around and see where the locals are" method. This is easy to do when "off season" touring. 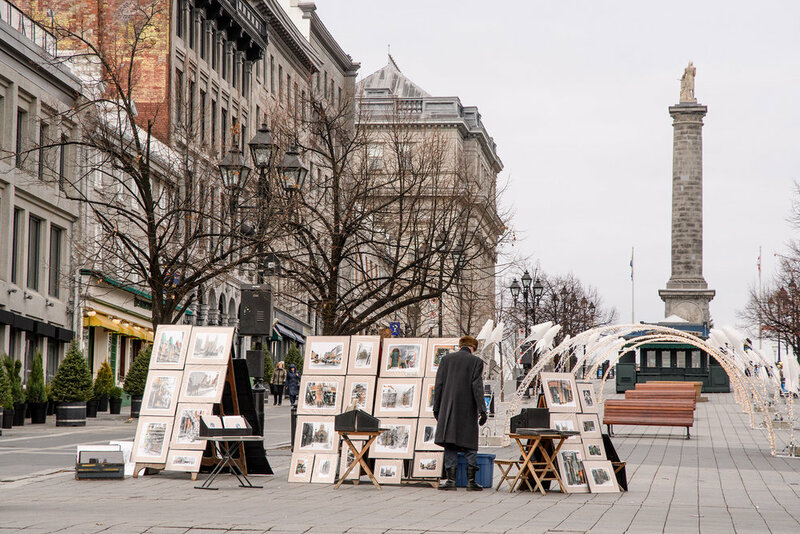 (For more on off season touring tips see our post here) During busier seasons, it's best to ask the concierge at the hotel, because restaruants could be filled with tourists who might not know better, and the concierge may be able to use their relationship to score a reservation on a busy night. I found Modavie just a block away, and filling fast. It seemed even more promising when I was followed by the saxophone player into the bar. It seemed like a neighborhood kind of place, with the staff dispensing lots of hugs to regular patrons, and the parents of the hostess, sitting next to me in the bar, promised I would enjoy the jazz band that started at 7PM. Jeff met me just before I finished my drink and we asked the owner if we could get a table for dinner. We were placed in the convivial dining room, near one of those blazing fireplaces, surrounded by locals celebrating a 24th birthday and a young Emirates flight crew enjoying a night out on the town. We were close enough to enjoy the 4 piece Jazz band, without being so close we couldn't converse. The specialty of the house was lamb, which neither of us eat, but everything else we ate was delicious, and the service was attentive without being pretentious. The waitstaff was so friendly, one even felt comfortable enough to photo bomb our selfie! It's not often you visit a place as a tourist and are treated like a friend! Modiavie's, Maitre d'hotel, Lorenzo, passed me his card and invited us back anytime...our very first dinner out in town showed the warm welcome we get from Montreal all weekend! The following morning we were up early explore Old Montreal. 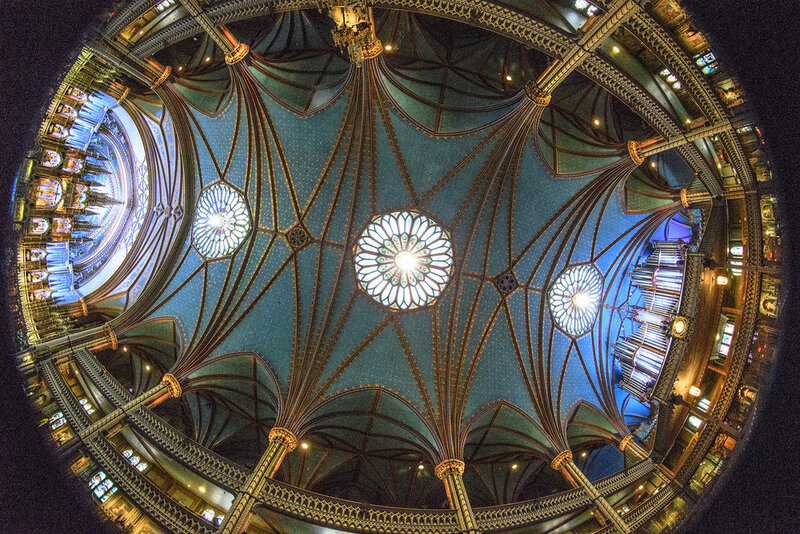 One of our first stops was Basilica du Notre Dame. The Basilica was located in the Place d'Armes, which has several historic buildings, including the bank and several interesting statues. 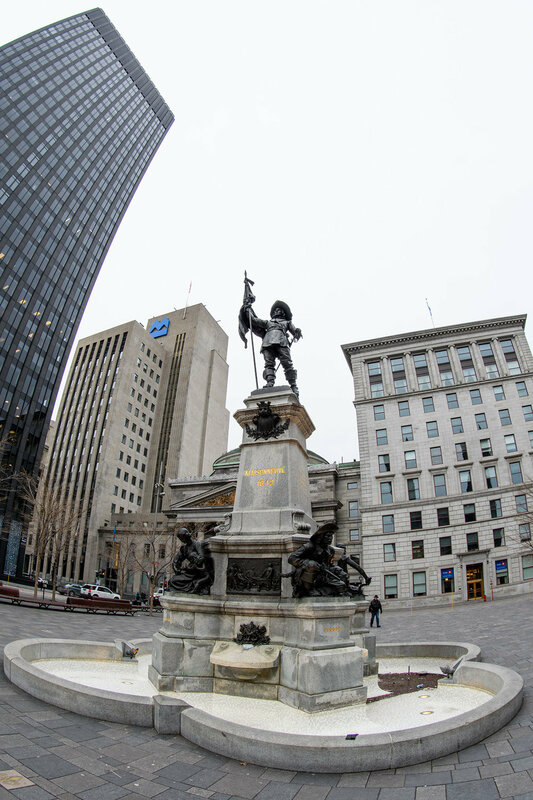 The Maisonneuve Monument by L. Hebert in Place d'Armes. 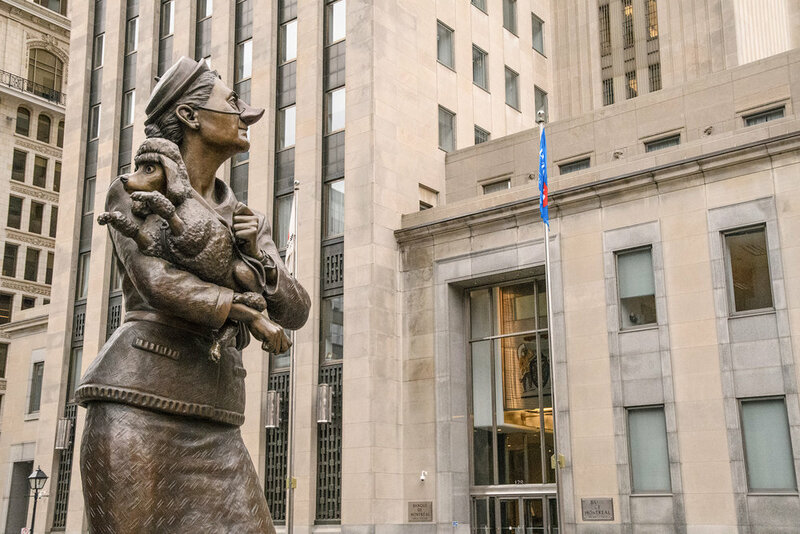 I particularly enjoyed the statues at the base commemorating other important residents of Montreal. 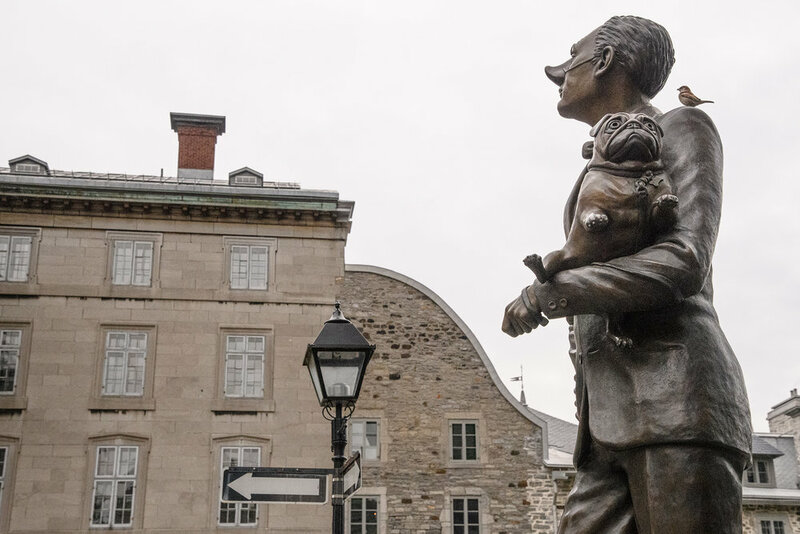 Be sure to take a peek at the base of the modern looking bank for two interesting statues that seeks to interpret the intersection of the relationship between the English and the French in Quebec! 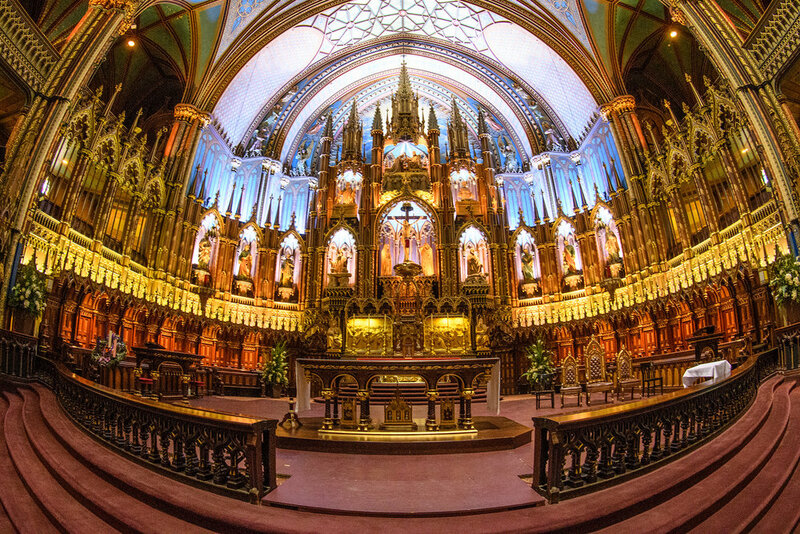 There are a few ways to tour the Basilica of Notre Dame; there is a group tour run on the half hour as part of your admission. Or you could arrange a private guide. Or you could do what we did, which was to wander around and read the placards at each chapel to fill in the details. Having recently spent several weeks in Italy and touring many, many churches, decked out with statues of male Saints, knights and popes I was delighted that Notre Dame, wasn't just about one Blessed Lady! 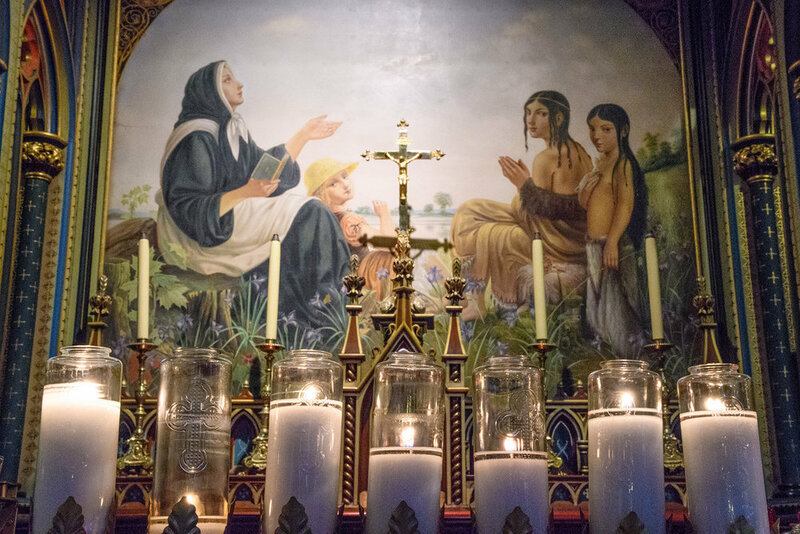 Throughout the Basilica are statues, paintings, and chapels all devoted to the a wide variety of strong French women, including nuns and beatified Holy women and Saints! As a woman who is 1/8th French Canadian herself, it was nice to see the woks and holiness of my ancestors! I know very well about strong French Canadian women who get things done and give selflessly to their communities and God! After touring Place D'Armes and the Basilica and surrounding areas, we walked along the river front, along Rue De la Commune. This area was very quiet this time of year (and I imagine could be much colder than the 30's F we enjoyed) in the off season. We enjoyed the views to the mainland across the river, and the huge Ferris wheel, Le Grande roue de Montreal on Il Bon Secours. A view up Place de Jacques Cartier to the Hotel De Ville (City Hall), with the closed down summer fun parks siting idle in the foreground. 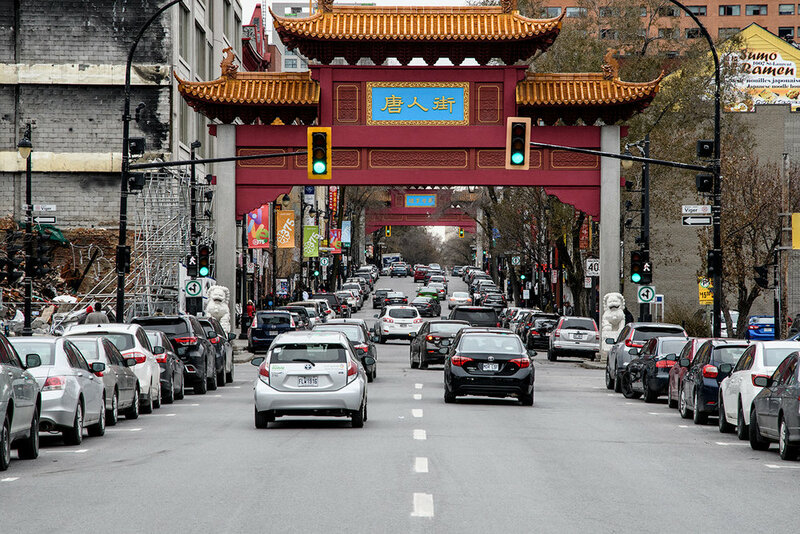 We decided to make our way to Downtown Montreal, roughly considered things west of Rue St Antoine. With short daylight hours, we decided to go to Chinatown for a quick lunch of noodles. We were headed for the seasonal Christmas Market on Rue St Catherine E. located at Place de Festivals. 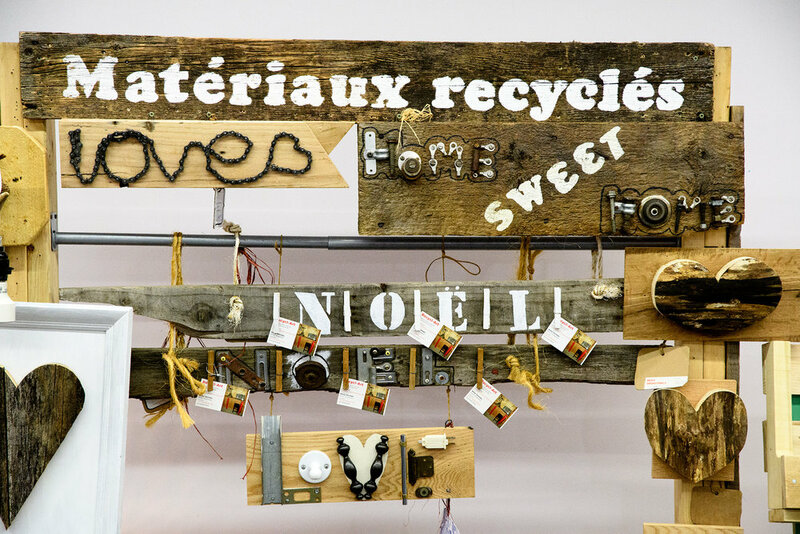 Along the way we were encountered volunteers encouraging people to visit the Maison du development durable, where the entire building was filled with a pop up fair of local artist showing their wares, each using recycled or reclaimed materials to create their art. Most of the local artists only spoke a little English, but we had no trouble expressing our appreciation of their work in our limited French, and we did a little Christmas shopping! Then made our way to the outdoor Le Grande Marche Du Noel. Above, "lightbulb" ornament, and recycled arts and crafts in the Sustainable Building Center. We enjoyed watching the local children sit on Mrs Clauses lap and ride around on a tiny train. We enjoyed "Snow on Sugar" a traditional maple sugar treat. 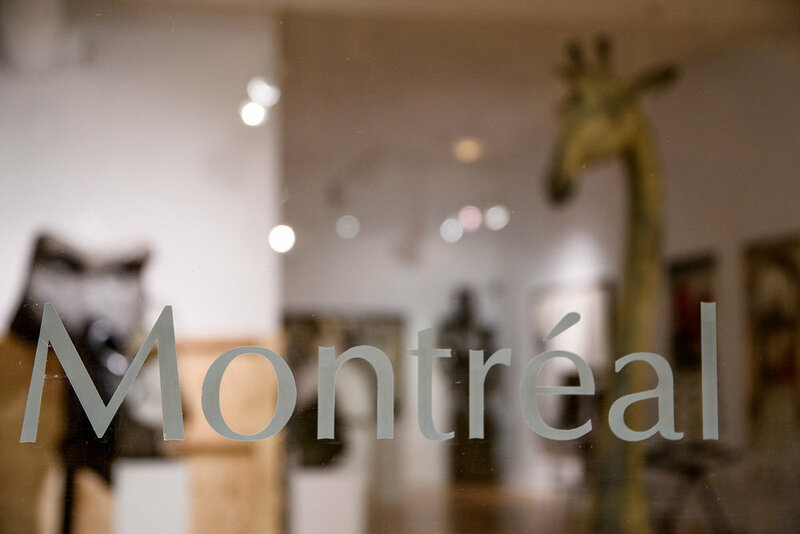 If you are visiting Montreal at other times of the year, this area of Rue St Catherine, is where you will find all of Montreal's excellent art museums! 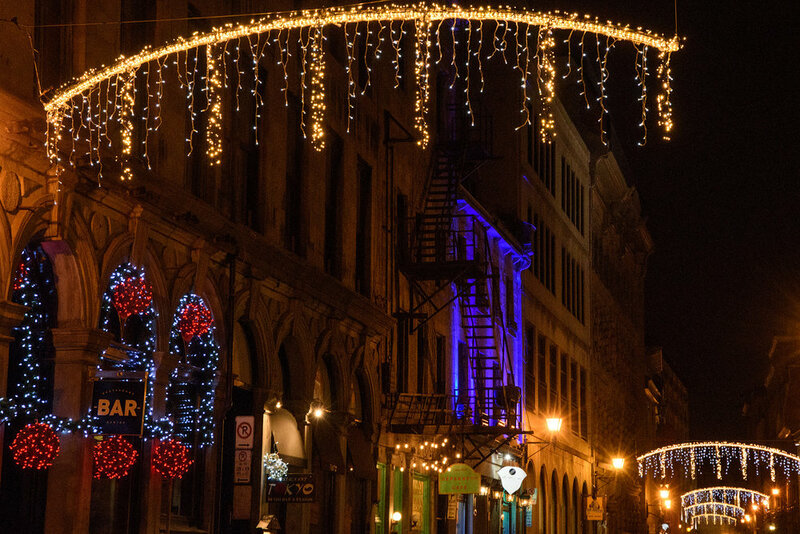 After enjoying the Rue St Catherine Christmas market scene, we headed back to Old Montreal for dinner and to take in the shopping scene along Rue St Paul. There are high end galleries and accessible tourist shops along Rue St Paul, as well as many restaurants and bars. 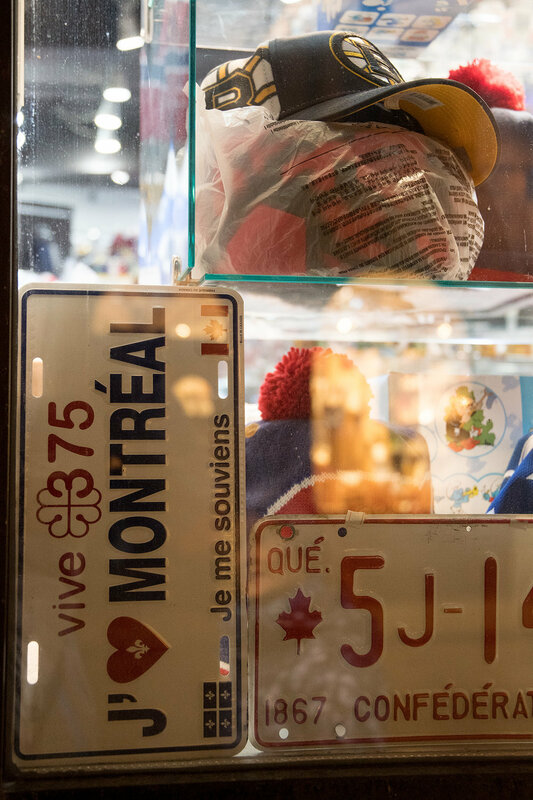 A surprising addition to the window display... hockey rival's Boston Bruins hat shares space with traditional Montreal souvenirs. If you look up at the historic buildings all around you, you might notice projections on the walls. 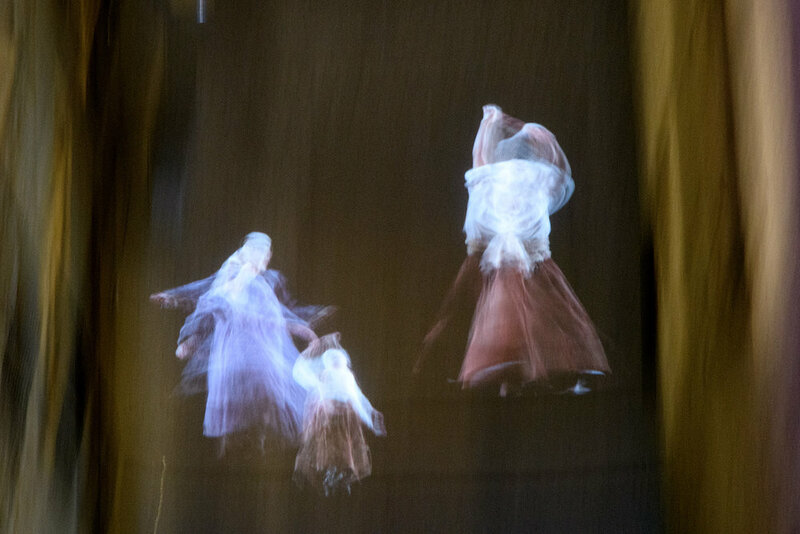 We wondered what these interesting, artsy looking projections were, and we learned that it is a project called Cite Memoire, an outdoor projection walking tour app. Even without the app, we stopped to enjoy several of the projections which shared on the spot history of the building or area it was projected! For dinner we made a reservation at Auberge Saint-Gabriel, which had been recommended in a travel article by Christopher Murther in our local travel section. As I often do, I hung onto the article for months, and then referred to it choose a good restaurant within walking distance. We enjoyed the funky decor mixed with the historic building, according to their menu, one of the oldest taverns in the Northeast. In addition to a cozy atmosphere with a blazing fire, and cauliflower on an a open brazier, the service was friendly and professional and the food was very well prepared and tasty! They say it's difficult to have a bad meal in Montreal, and we found that to be true! It was enjoyable to have fine dining in a relaxed atmosphere with friendly, unpretentious service! Cauliflower on the brazier, cauliflower and mozzarella appetizers, flank steak with rapini and fries, salted caramel and chocolate pie. Our intention was to visit the speakeasy attached to Auberge St Gabriel, but staying awake for it to open at 11, seemed insurmountable when we finished dinner at 9:30 PM! 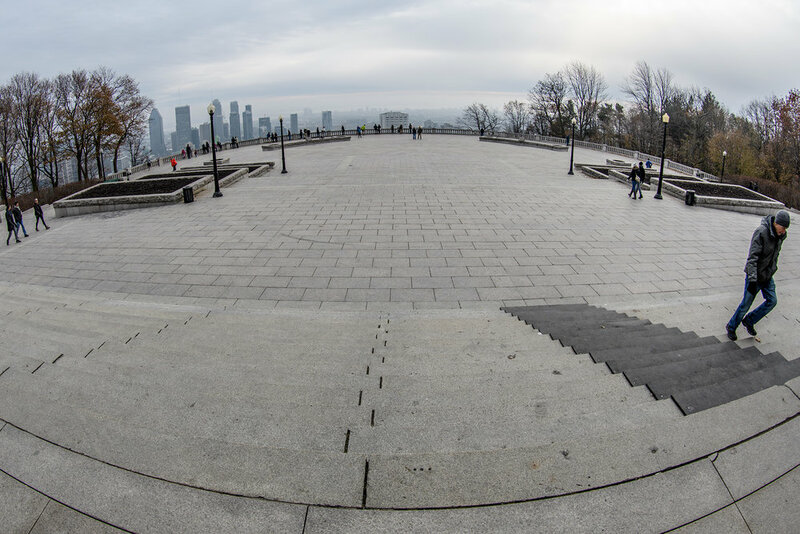 View of the city from the Chalet Mount Royal, a beautifully designed chalet and viewing plaza atop Mount Royal. After a good night's rest, we decided to visit Mount Royal Park, (200+ meters elevation) in the center of the city. The park is free to enter but there is a charge to park. We enjoyed the ride up to the park, driving through some lovely residential neighborhoods and McGill University. We were amazed at the amount of local people enjoying the park. Thirty to forty degrees in December is warm, and the local folks seemed to taking advantage of the unseasonably warm weather! There is also a skating rink and lake as well as miles of walking trails. Facilities including information staff, washrooms and cafes, can be found in Smith House and the Chalet. A little black squirrel, on an unseasonably warm Sunday in Montreal, getting ready for cooler days ahead! We travel the globe with mantra that "there is no bad weather, only bad clothes". We were prepared with all our warmest clothing when we visited Montreal before Christmas. In the end, we didn't need much of it; the warm welcome of the Quebecois and the city of Montreal kept us feeling warm and cozy all weekend!